Working with difficult people invariably results in workplace conflict, not only with colleagues but with the public and patients too. This is likely to be detrimental to your health and wellbeing, and the patient/client's outcomes too. 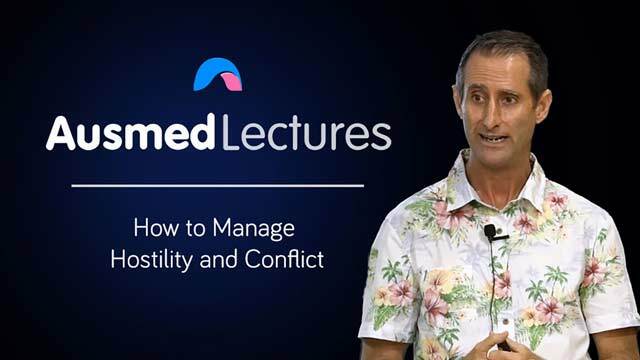 Watch this session and learn how clear communication and a cool head, when faced with hostility, can help YOU manage conflict better. Sean Smith has had the privilege of working in health care for three decades in more than a dozen countries around the world. Commencing his clinical career as a registered nurse, Sean progressed into hospital management, before spending eight years as the CEO of a large healthcare provider. Sean has built two healthcare businesses and consulted to industry around health informatics, healthcare management, and healthcare strategy. Most recently Sean has managed the largest medical provider network in Australia and collaborates with more than 600 hospitals across the country to provide healthcare for 230,000 international students. Sean has experience with clinical and non-clinical systems planning, implementation, and deployment in Australia, New Zealand, Papua New Guinea, and the United Kingdom. With a passion for healthcare education, Sean has educated from university healthcare students in Australia to community health workers in Papua New Guinea. Sean provides clear, concise consultation through his experience in clinical management and information technology, to ensure projects are delivered with the best possible outcomes for all stakeholders, on budget and on time. His passions are strategy in health care, quality in clinical practice, and excellence in health management. Sean holds a master of business administration, a graduate diploma in advanced nursing, and is a member of the Australian Health Practitioner Registration Authority, the Australian Institute of Company Directors, and the Chartered Institute of Procurement and Supply. Sean continues to provide leadership and strategic direction for all stakeholders to deliver the highest possible standards to exceed current and future healthcare needs. This source is valid and evidence based research. It added new information to my knowledge which I gained for a better outcome if I happen to experience a conflict in my day to day life .